Small covered porch leading into hallway with tiled flooring Kitchen - Tiled flooring, double stainless steel sink, Dishwasher, cooker, fridge/freezer, microwave, toaster, coffee maker, small wooden dining table with two wooden chairs Bedroom 2 - Carpet flooring, Queen bed with burgany/stone/white patterned bedding, Television, closet, external entrance door EnSuite to Bedroom 2 - Single sink, toilet, bath/shower, Green/Brown striped shower curtain, Tiled floor Half Bath - Toilet and single sink Dining Area - Wooden Dining Table with 6 chairs Family Room - Sofa and matching loveseat with accent cushions, coffee table and small accent tables, tiled floor with area rug, Flat Screen television, DVD player, Cable Television, Wifi, Sliding glass doors leading out to a small patio area with a pretty water view Carpeted stairs leading up to second floor - Master Bedroom - King Bed with Burgundy/stone/white patterned bedding, Television, closet, carpet, sliding glass doors onto balcony with lovely water view Ensuite bathroom - single sink, bath/shower, toilet, tiled floor Laundry Closet - Resort style washing machine and separate tumble dryer Bedroom 3 - Two Twin beds with black/red/white Mickey Mouse bedding, television, closet, carpet Bedroom 4 - Two Twin beds with blue Mickey Mouse bedding, flat screen television, closet, carpet Family Bathroom - Single sink, bath/shower, toilet and tiled floor Regal Palms Resort & Spa is a safe, private, gated resort which can only be entered with electronic key cards. It has two heated pools, a children's pool, a waterslide, lazy river ride and a heated jacuzzi surrounded by waterfalls. Within the clubhouse there is a restaurant, sprts bar and a game room Please Note: There is a resort fee which is paid to Regal Palms directly for their facilities which are really good and include pool, lazy river, slide, gym etc. This charge is $12.95 + tax per night per house. A credit card is also needed as Regal Palms take $150.00 authorization as a fully refundable security deposit. 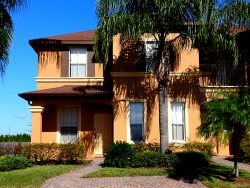 Amenities Large 4 Bedroom Home Modern Fully Equipped Kitchen Wifi Use of all Regal Palms Facilities Large Flat Screen TV Two Master Suites DVD Player and Selection of DVDs Close to Disney Attractions Local Area Outside the resort nothing is too far away. Berry Town Centre Shopping Plaza is within easy walking distance. The Plaza has a Publix supermarket, CVS drug store, Bank, ATM, Fuel station, Applebees restaurant, Pizza parlor, British Bar and Fish & Chip Restaurant. Area Attractions The resort is 8 miles from Disney and the Theme Parks and 25 minutes drive from Orlando International Airport. In addition to being directly opposite the entrance to the Prestigious Highlands Reserve Golf Course and Driving Range, the resort is only a short drive from a host of other highly rated Central Florida golf courses. These include Southern Dunes, Orange County National and Reunion Resort.